This is all very scary to someone faced with unpacking not one pair but two pair tomorrow or Saturday, 707s and 703s. F1nut, when you say poor quality control, what do you mean. Is this tweeter issue a bad tweeter, a bad part in the crossover network, a poorly designed tweeter, since you are familiar with this particular problem, what exactly is it caused by? I am assuming everyone posting on here is purchasing their LSiM speakers from Adorama in New York City. You know, one thing I find a bit concerning, these speakers have received good reviews by many people, and there are, I think, about 80,000 forum members, yet apparently only a hand full of people took advantage of a 67% off sale, does that seem a bit odd to anyone else?? Not really. A significant percentage of people here probably have a hard time wrapping their head around the notion that Polk speakers could be "audiophile". Another subset may be suspicious that heavy discounts mean there must be something lacking or wrong with them. Lastly, the fact that these speakers seem to need a pretty beefy amp to get them to sing may deter some folks. Did that. Distortion stayed on the left speaker. Sorry, but do you mean it stayed on the left channel or that it stayed with the speaker? If the latter, check that the screws mounting the tweeter and rubber surround are intact. Something could’ve shaken loose during shipping. Vinny123 and George P like this. Most people are underpowering their speakers with an AVR regardless of speaker make/type. Sure, sound may come out, and it may be decent, but when you go with a separate Amp (or Amps) it can be a major difference - all for the better. SandAndGlass and Audiowannabee like this. Where were these issues reported about that you became aware of it? I do see one or two responding to me on the Polk forum but you seem more knowledgeable about the problem being a known issue which to me means more then a few and it’s public info somewhere. I just want to research to be sure they don’t send me yet another faulty speaker. Just call Polk for a warranty replacement tweeter. The LSiM is a better balanced, more refined speaker. The LSi tweeter was just a bit too laid back and side firing LSi 15 woofer was too slow and muddy. There is a mod using a Polk car woofer that results in much better bass performance. SandAndGlass and tlainhart like this. only a hand full of people took advantage of a 67% off sale, does that seem a bit odd to anyone else?? Some of us took advantage of Christmas 2017 sale. I got 2 705's, 2 703's and the smaller center channel 704 for $1399. SandAndGlass, displayname, aroney and 1 other person like this. That was the best LSiM deal of all, even better than the current deals I think. SandAndGlass, displayname and M.R.Collins like this. M.R.Collins, SandAndGlass, Audiowannabee and 1 other person like this. I think that you are fine, running 703's with an A23. There is no need to upgrade for that reason alone. Since the A21 is a far better amp in all aspects, I could see you upgrading for that reason. If you did, you very may get some extra performance out of your 705's. In both cases, I meant to say "705's". Wow! T-rex sounds amazing on the 707's! Audiowannabee, displayname and SandAndGlass like this. Broke out my Polk SDA CRS's yesterday, which I haven't listened to in many years. Conrad-Johnson MF-80 amp driving them. NuForce MCP-18 preamp. I have only listened to vinyl and AM/FM so far, but these speakers sound better than I remember them sounding. So much bass yet very balanced. Thought about upgrading them (tweeters) but they sound too good. Sorry for going off topic, but this thread inspired me to dig these out from the back of my closet. Listening to 88.5 FM Tampa, Saturday Asylum radio show, and the sound is splendid. gudnoyez, SandAndGlass and F1nut like this. Always wanted a pair of the large SDA's way back when. It never happened. Well, my (2) 707s and (2) 703's showed up 1.5 days after they were ordered. I now have both of the large speakers unpacked, and will set those up tomorrow. I did spend some time listening to one Aerial 10T and one Polk 707 and honestly, at this point in time, I really do not have a comparison, it's going to take some extended listening to the new speakers, but the Aerial's are HARD to beat, as they have been one of my favorites for years, next to the Vandersteen V, which at the time I could not afford. I want to hit on one thing that made a huge impression on me, and that was the lack of quality material used in packing these speakers. Yes they come double boxed and my outer boxes were beat up, dog eared and to me, felt slightly moist. There were punches and small holes and scrapes everywhere, however nothing seemed to get through to the main box, BUT, here is the kicker. Once I got into that main box, there are three styrofoam pieces positioned at the top, bottom and middle and I suppose, because of the rough handling by UPS, the styrofoam pieces are are broken apart, at least mine were, not in one but BOTH shipments, have not even attempted to look in the 703s yet! Additionally the rubber grommet around the bottom woofer had fallen off of both speakers. It clicks back on fairly easily with a bit of positioning, but it should not fall off, and both of mine were off in the bottom of the box. Another warning, if you order these, BE VERY CAREFUL TO FOLLOW THE OPENING INSTRUCTIONS, VERY CAREFULLY, it is very easy for your to puncture a driver, very easy. IMO, Polk has done a "crap" job with the packing, method of packing, quality of packing and especially those worthless styrofoam positioning pieces. In both of my speakers theses things were broken all to pieces, and IF you EVER want to ship these speakers again, you better darn well repair the positioning pieces, or these speakers will be destroyed in shipping, and I am going to tell you how to do it, and it's a time consuming process. As the pieces come out of the packing, take each piece and figure out which broken piece goes where, which for most part is easy. I went to Walmart and bought a large heat glue gun and lots of packing tape. I spent about $25.00 or more, because I want to be able to ship these speakers to someone without fear they will make the trip! I glued each broken styrofoam piece, then put heavy tape on the pieces to hold everything together. I then patched the outside of the shipping box, mine was all beat up. I will report on the speakers in the next few days, but I'm just now getting over the WORST unpacking job I have ever endured, period. Oh, if you do not follow the unpacking instructions to the tee, you will damage the front metal grill, which is suspended in these front mounted styrofoam pieces that break all apart. I am VERY impressed with the speaker construction, it's much more robust than I ever expected, however, for those of you interested in purchasing a pair of 705s or 707s, you better be real ready to do some serious repairs on the boxes and especially the styrofoam positioning pieces (3) in each carton, and for me, this ordeal WAS NO FUN AT ALL!!!!!! I have never received a pair of speakers from Polk that arrived in this condition. It has been awhile and I do think that from shipping I might have had one or two cracked pieces in one of the boxes due to slight mishandling during shipment. As a result one of the metal grills had been damaged and had to be replaced by Polk, which they did without issue. As Litejazz53 has commented, be very careful that these grills do not get damaged. they are not like a plastic grill that you can twist a bit and if it is not enough to crack the plastic, the grill will return to its shape. Plastic grills are held on by plastic pegs, that go into little plastic sockets that are mounted in the face of the speaker cabinet. These metal grills are held on magnetically and are supported by a 3D Polk oval shaped logo, toward the bottom front of the cabinet. this Polk name badge supports the downward weight of the metal grill, but it is held in place magnetically. If the grill gets twisted in the slightest, it will not stay attached to the front of the cabinet and will fall off. Just a word of caution here. Be very careful in handling the grills. Do not move the speaker's around with the grills on, take them off first, so they don't get jarred, fall off and get bent. When you remove the grille, take extra caution to place them where they will not be disturbed, before you put them back on the speaker's. From the damages that Litejazz53 is describing. Im am getting the impression that these speaker's were seriously mishandled somewhere along the way, while in transit. With the obvious damages that are being described here, to the outer boxes, I would hope that they did not leave the dealer's facility in that kind of shape! This does not appear to be something that Polk can be considered to be at fault with. This is pretty much my feeling. For years I used to wonder whether my speakers could use more power. Now I hook everything up through a Crown or Hafler amp. It takes power out of the equation. Gumboo, SandAndGlass and aroney like this. I think that you bring up a good point here, that deserves further comment. If you want really good HT sound, then you may need to purchase a AVR in the $2k price range. The problem with doing this, is when HT spec's change, then your receiver is obsolete and you have to start all over again, with another expensive AVR. For this reason and other reason's being my amp preferences and the fact that I use same power amp for both HT and stereo, I want to choose the power amp that I want to match the speaker's that I am using for both, which was at present, the LSiM707's. Bringing a processor into the picture makes this possible. Last year my older processor's LFE channel went out, so I replaced it with a newer 4k Emotiva processor. Everything else in the system remained the same. When you set up your system with the HT based around a processor, then the processor becomes just another source component in the system. I have a 250-Watt Emotiva XPA-2, generation one power amp driving the left and right front mains, for both HT and stereo. I have a separate mono version, an XPA-100, which is also 250-Watts driving the center channel, which is used for HT only. Making a processor a component, just like you other components give you so much more flexibility and allows you complete freedom to construct the other aspects of your HT or stereo around the equipment of your choice. Litejazz53 and aroney like this. Repacking the speakers was no fun either and some of the styrofoam pieces needed to be taped together when they broke apart. With the help of a friend, we finally did manage to get everything back together with the exception to the spacer that fell out do to missing screw threads needed to secure it which I mentioned earlier. That and the port plug which had broken loose from the bottom of the same speaker. Outer boxes provided by Audorama are intended to be sacrificial, while providing additional protection to the Polk factory packaging which is not the strongest to begin with. Years ago when I got the A9s, one boxes arrived punctured with a baseball sized hole - which thankfully didn't damage the speaker. My friend who just got his A7s, one his boxes also had holes and deep tears, but fortunately neither of his speakers were damaged. Whenever I ordered from Polk directly in the past, they were simply shipped in the original boxes without the added protection. Good move on Audorama's part. I just got my $1,200 credit back for the returned speakers less $67 for the return flight. I couldn't agree more with the packaging of the grilles between the styrofoam. It's a terrible idea. All of my speakers i have had arrived shipped to my house...the moniter 60s boxes arrived looking like the ape from the samsonite luggage commercial had played w them...amazingly the speakers were not damaged...the Rti s outsideboxes looked the same...however 1 was damaged with a nice big nick in the side which was replaced by cruthfield. I have a lot to say about the Polk LSi707, but I just got them all nicely placed and hooked up today and I hope what I share will be helpful in the event you a planning to purchase a pair or the 705's. For those of you that are thinking, this guy must be a bit over the top about Polk's poor methods of packing, remember, we are dealing with freight carriers, UPS, FedEx, people that don't give a hoot if your package makes it to you in one piece or not. If this company had not double boxed these Polk speakers, they absolutely would have been damaged. Here are just three "small" examples of how their materials just DO NOT hold up in a shipment. You will NEVER find this with a Wilson or an Aerial product or a PS Audio or Parasound product, at least I have not. Now, this is the inner box, not the outside box!! Trying to tape and glue this mess back together was a true mess from Hell! We already know the freight handlers don't give a rat's hoot about anything, so the speaker manufacturers MUST use better packing techniques, period! Guess I should consider myself lucky as my 707's weren't even double boxed. A few nicks and dents, but the speakers were okay, and I didn't have much trouble opening 'em up and getting 'em all set up. I'm happy with the 707's and they'll be my main speakers for the foreseeable future. Litejazz53, Rekkerds, riverrat and 1 other person like this. Anything that I have shipped from Polk or through NewEgg always have been in their original boxes. 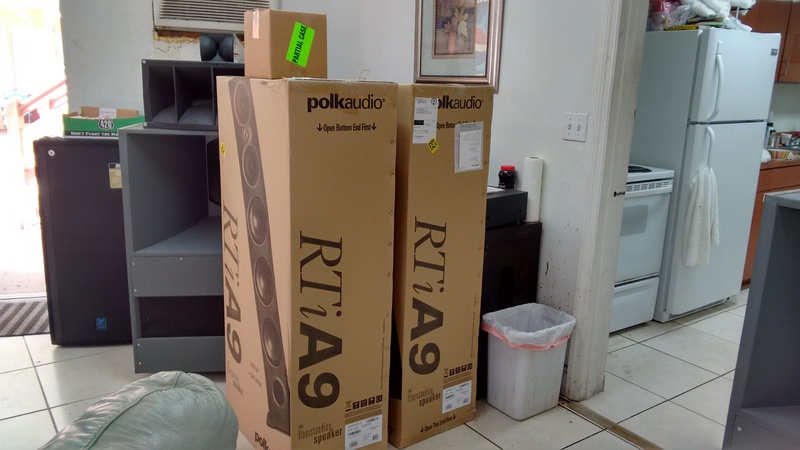 Here are a pair of RTiA9's that were shipped directly from Polk. 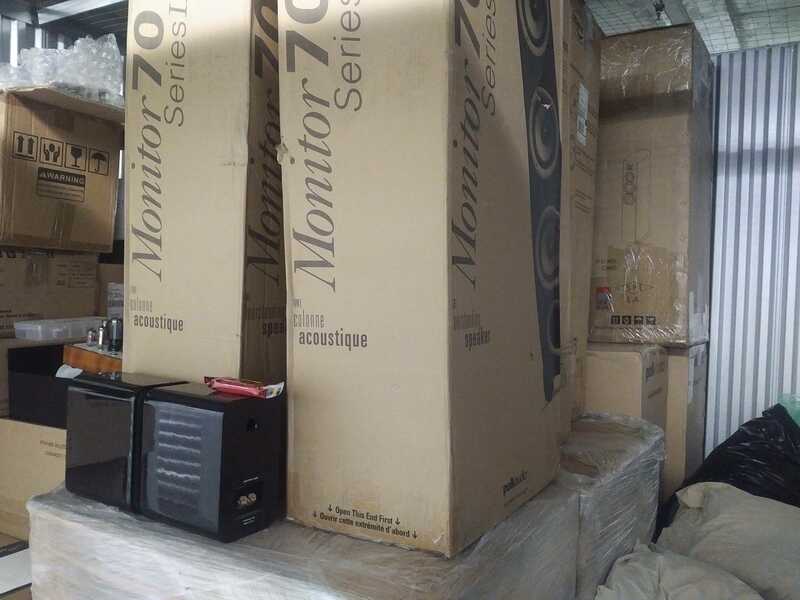 Here are the Monitor 70's series II, shipped from NewEgg, that are sitting in one of the two warehouses that I have rented.